Last evening the almost full moon. I took this photo through our living room window while sitting on the couch! This morning while riding my bike! Evidence of a passing hail downpour! And then the sun came out. For a moment. I just got a photo from my son Jeff. 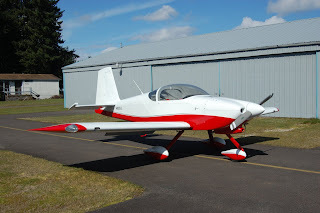 He had a sunny day in Tacoma this morning so rolled his homebuilt airplane out of the hangar for a photo op! This is the one he and I painted last summer and this is the first photo of it all together. He plans to start the engine for the first time in the next two weeks; still some small items to be finished and a final inspection to be passed. Wow it sure is a beauty! That airplane is gorgeous! And I, too, am enjoying the changeable weather. That plane is beautiful. I've been following its progress. You two sure are talented. Great job! You son's airplane is very cool. 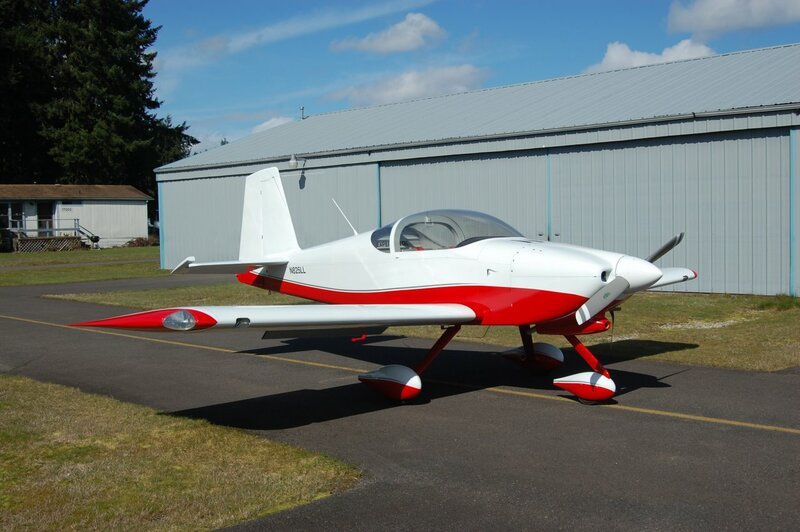 Is it an RV 7 or RV 8, I can't quite tell them apart yet? How about an RC version? If you produce one, I would like the plans and I will do an electric version. I will watch for a blog about it.